Photo by Jenny Neyman, Redoubt Reporter. 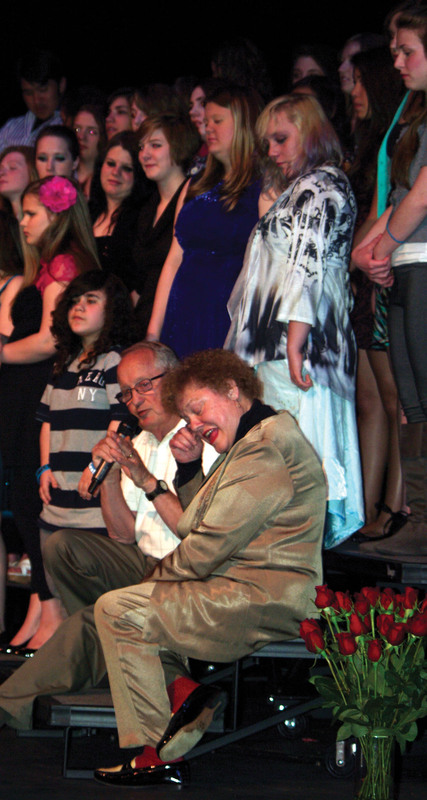 Retired Principal Dale Sandahl, who hired Henderson in 1971, drew laughs and tears during a tribute to Henderson at her final KCHS Pops Concert this spring. As successful as the Kenai Central High School choir has been under Renee Henderson’s direction, the obvious assumption, looking back over her 43 years teaching in Kenai — in an auditorium named in her honor while she was still using it, no less — is that the highest notes of her career would have something to do with the staggering array of accolades earned by her choirs over those years. Perhaps regarding the scores of her students who have not only been accepted to the honor choir at the borough and state level, but the All-Northwest and All-National honor ensembles, as well. Or the esteem of having her touring choirs distinguish themselves at international competitions among much better-known groups from much bigger schools, and being able to perform in grand, historic and exotic cathedrals, concert halls and other distinguished venues internationally. Her office, one would think, would have been papered with awards, plaques and other such mementos of achievement. Her favorite students would be the ones with elite singing abilities. Her primary impetus in passing the 30-, then 40-year career mark before finally retiring this year would be to maintain her choir program’s sterling reputation. That all would certainly be understandable as Henderson’s motivation to keep teaching so long that her last class could have been the grandkids of her first, and that her current school principal was born the year she started teaching. But none of it is the case. Henderson’s choir has indeed achieved an impressive array of recognition for excellence over the years, but those honors aren’t even mentioned when she’s asked about the proudest achievements of her career. Her office was certainly papered, but with not with awards — rather, with school portraits, graduation announcements, notes, artwork and other mementos from her students. And those students? 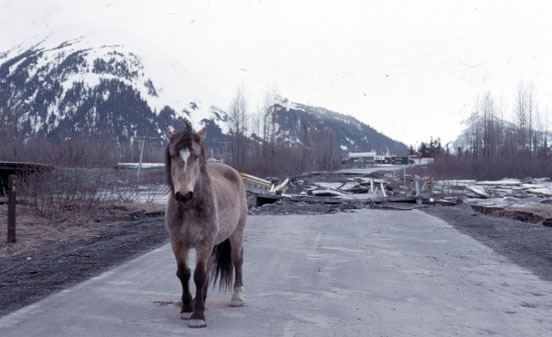 About 17,000 in Kenai since 1971. Some that have stood out the most for her were the ones with the best voices and most natural musical ability, but that relationship is coincidental. Just like the side effect of her career is accolades, of which she’s happier for the recognition for her students than herself. It’s an outgrowth of why she’s done what she’s done, not the purpose behind it. A vocal flourish, rather than the foundational melody. It all starts on one simple note — Henderson likes kids who like to sing, even if they strike the wrong chords along the way or can’t seem to find any of the right ones to start with. If they’ve got drive and are willing to try and hit the right notes — whether that be in choir or life in general — she’s willing to push them, and herself, to the limit and beyond to make sure they tune in to whatever melody is in their hearts. Photo courtesy of Debbie Boyle. 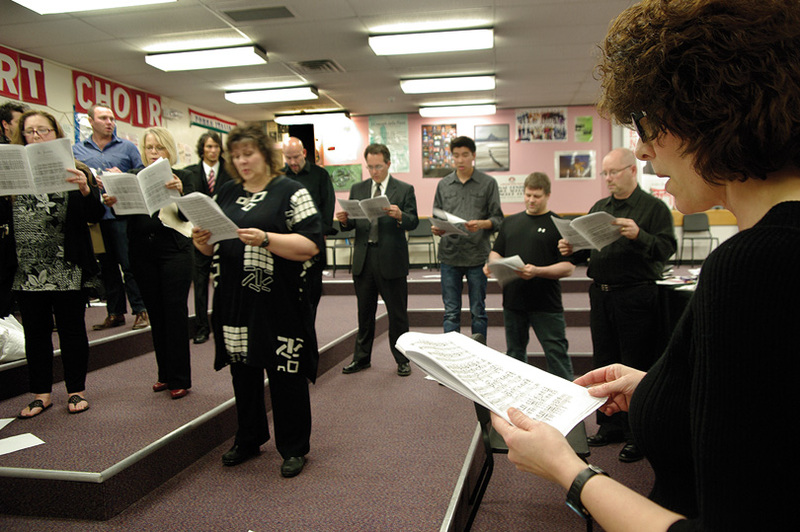 Renee Henderson lowered the baton on her 43-year teaching career in Kenai this spring, spending decades as the director of the well-regarded Kenai Central High School Choir. Henderson is as hard pressed to name a favorite song as she is to pick a favorite memory of her career. There are just too many of each. But a theme emerges. The students she’s been most affected by aren’t the ones who’ve been polished performers or perfect-A students from the get-go. Natural ability can lead to bright futures, but to a Midwest rancher’s daughter, achievement without effort can breed ego, and though Henderson has for decades devoted to her students more hours than there should be in a school day, she’s never had time for arrogance. “I like not having elite groups because I just can’t stand the attitude it breeds. It feeds on itself,” she said. Though a quibbleable point, Henderson herself doesn’t consider herself a naturally exemplary singer. She had taken vocal and piano lessons growing up but didn’t think she was very good, certainly not to the caliber of her mother and brother, and ended up being a trumpet performance major in college. Still, she loved singing and worked hard at it. Perhaps consequently, she’s particularly drawn to dedication — the hard workers, the kids with, perhaps, poor ears, but rich hearts. 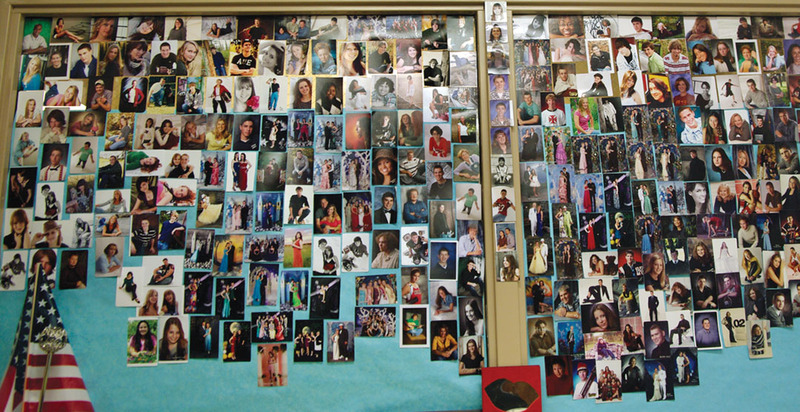 A sampling of the decor in Henderson’s office — walls papered with mementos of her students, who number about 17,000 over the course of her 43-year career. One of her fondest moments was with a student who, “couldn’t carry a tune with five buckets, but was one of the greatest kids I’ve ever met. I just really, really like him. He asked if he could be in choir. I said, ‘Certainly. Everybody can be in choir,’” she said. He was in it with his whole heart, even if that didn’t at first resound well on listening ears. “That droning sound pretty much carries — not always the pitch you want, but it carries to the audience. But he tried every day of the class, and the kids were wonderful, they would stand by him. And to see the look in his eyes when we were performing, feeling as wonderful as the kids singing their very best — that’s a magical moment for me, it really is. 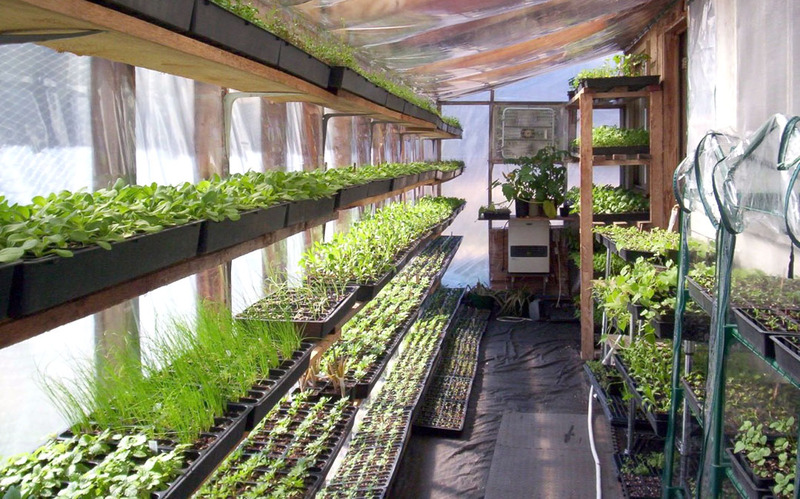 And I’ve been blessed to have hundreds of them,” Henderson said. Another student was up front about his reasons for wanting to join choir — because his friends were in it, and it was a year the choir would go on one of its legendary overseas tours. Steven Campenella and Andrew McCubbins, class of 1999, reprise their senior-year performance of “Play That Funky Music White Boy,” to close Henderson’s last Pops Concert as the KCHS choir director this year. 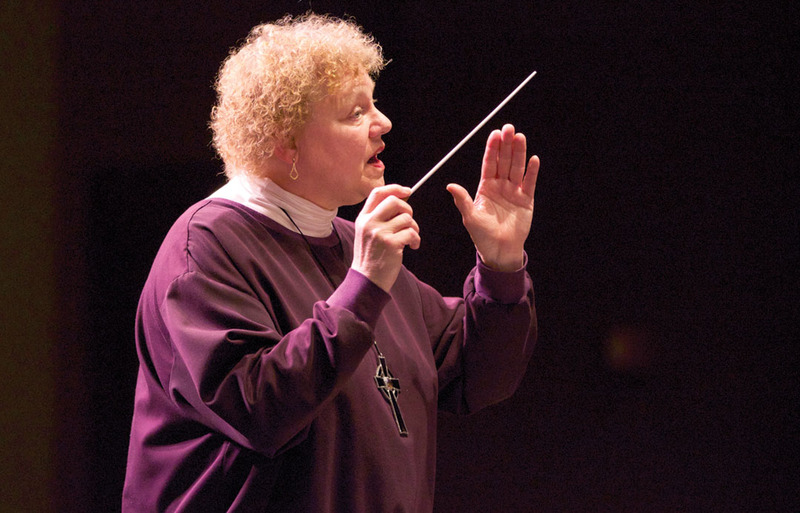 The concert included several performances by alumni, many reprising some of Henderson’s favorite pieces over her 43-year career. The year ended, as is tradition, with the KCHS Choir Pops Concert, where selected students get to perform any song they want, often whatever pop hit is dominating the airwaves at the time, backed by a live band of musicians from the community. He sang at that year’s Pops Concert. It might not have been completely pitch perfect, but moments like that have been music to Henderson’s ears. Her connection with students kept her teaching longer than anyone else in the district, said friend and longtime KCHS piano accompanist Maria Allison. “I know for a fact she did not want to retire and stayed on the job longer because there were so many kids she wanted to see through to their graduation. And that specific kid or kids often kept her up nights, calling, showing up for help with family issues or personal stuff. There were always kids in need, and I believe she kept putting off retirement because of their greater need, greater than her need to retire,” Allison said. Joining choir is a routine part of the KCHS experience for most students, whether they’ve had musical experience or not. And Henderson wouldn’t have had it any other way. None of her overseas tour groups were hand-picked, and the Pops concerts have lasted four or more hours to include as many performers as possible. The nature of the school schedule usually results in a switch out of 30 to 40 students each new semester, some of which might have limited, if any, choir experience. That left Henderson having to quickly mold the ever-changing groups into something harmonic in time for winter and spring concerts — a challenge, to be sure, but that’s not something from which Henderson shies away. More importantly, it’s best for the kids to be able to try this and explore that, she said. The inconvenience of it to her or anyone else is inconsequential by her sacrosanct rubric — do what’s best for kids. “I think at this small a school that’s what it should be, because it’s the last chance for them to take different classes. I like to encourage that, but I like them to know they’re welcome to come back,” she said. “They might be gone a semester, they might be gone two years, they take some other classes and they might find, for example, that they’re really good at art, and never come back. And I never mind that. I think, ‘Wow, you found a new passion for yourself, that’s wonderful,’” she said. Students did tend to come back, though, or at least take one pass through choir at some point. All of them — from aspiring musicians to athletes to anyone else. 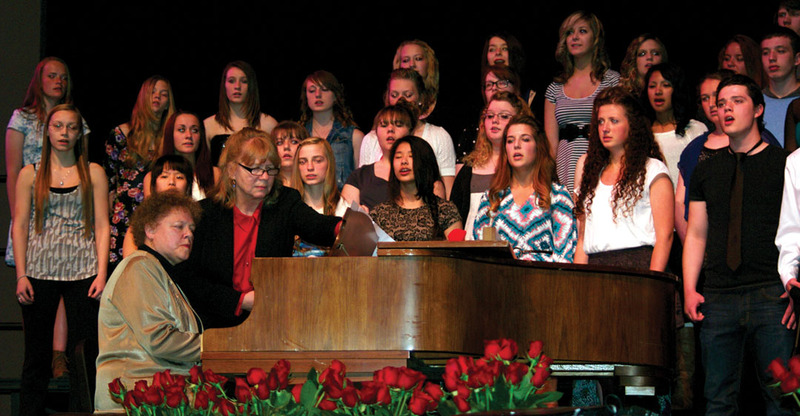 Alan Fields, principal at KCHS, remembers vividly watching his first annual Kenai Peninsula Borough School District Mass Choir Concert, where all the high school choirs perform separately, then as a group. Out they came onto the massive Renee C. Henderson Auditorium stage, small- and medium-sized choirs, adrift in the middle of the array of choir risers. “I’m thinking to myself, ‘Why do the risers go all the way across the stage? What is the purpose of that if they keep walking these little choirs out here?’ Then the Kenai Central High School choir comes in, and they keep coming in, and keep coming in, and keep coming in, and fill the entire risers (routinely upward of 60 students a semester). 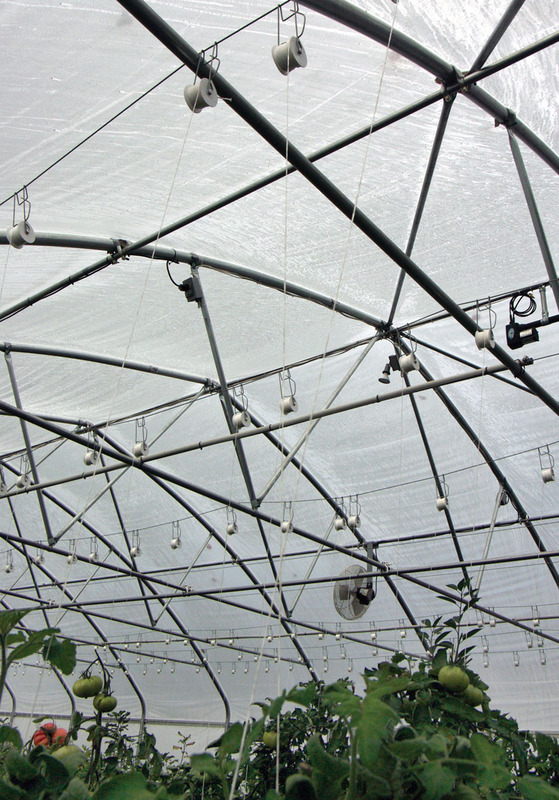 And then they start to sing, and you’re completely wowed and blown away,” Fields said. KPBSD Superintendent Steve Atwater had a similarly memorable experience at his first KCHS concert. Andrew McCubbins, class of 1999, was one of those unlikely choir kids in high school. But just like Henderson didn’t shy away from tackling challenging music, she didn’t shy away from kids with challenges, or challenging kids. “I think, had she not roped me into choir in high school, I wouldn’t have turned out the way I did. I think people make some mistakes, and if they get caught they’re stuck with a particular label, so they go down that road. But Renee was always saying, ‘You’re not that person, that’s not you. You make a mistake, you get back up from it and continue on.’ She’s not afraid to tell you to get your rear end in gear,” said McCubbins, who now lives in Salt Lake City with his family and owns a telemedicine company. Audra Faris rehearses a group of Henderson’s choir alumni who came back to KCHS to participate in their former teacher’s last Pops Concert this year. He and classmate Steven Campenella, now living in Anchorage, came back to Kenai for Henderson’s final Pops Concert this year to reprise their performance of Wild Cherry’s “Play That Funky Music White Boy,” complete with shiny shirts, tight pants and dance moves. They hadn’t sung it since their Pops performance in 1999. “I heard Renee was retiring and I got a text message from Mary (McCubbins-Holt) saying, ‘Play That Funky Music White Boy,’ and that’s all she said. I said, ‘If Andy’s game, I’m game.’ We slapped it together singing in the back of the green room with our iPhones. We forgot most of the lyrics halfway through, but right before we had to sing them they all came back,” Campenella said. The entire extended McCubbins clan counts Henderson as family, but that relationship didn’t mean any leniency for the kids growing up, Andrew McCubbins said. At one point he was going to transfer out of high school and move to California. That, to Henderson, was as unacceptable as not paying attention in choir rehearsal. Mary McCubbins-Holt, class of 1990, had a “Renee moment,” herself — skipping school as a senior. Henderson found out about it and contacted the father of household where the students were hanging out. They were busted. “I was like, ‘Seriously, Renee?’ She still loves it. I wouldn’t say she gloats, but she still kind of giggles about turning me in,” McCubbins-Holt said. It was reinforcement of a lesson well learned — don’t mess with Henderson, though McCubbins-Holt is likely one of the very few students who can claim they got even a partial one over on Henderson. 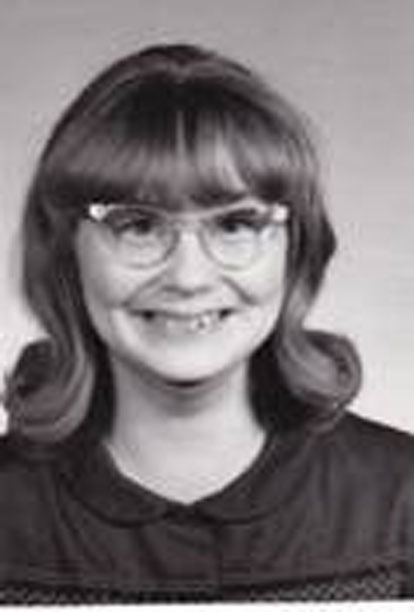 She got two Saturday schools of detention for skipping, but one was canceled when Mount Redoubt volcano erupted — a force greater than Henderson. “That’s probably the only one,” McCubbins-Holt said. 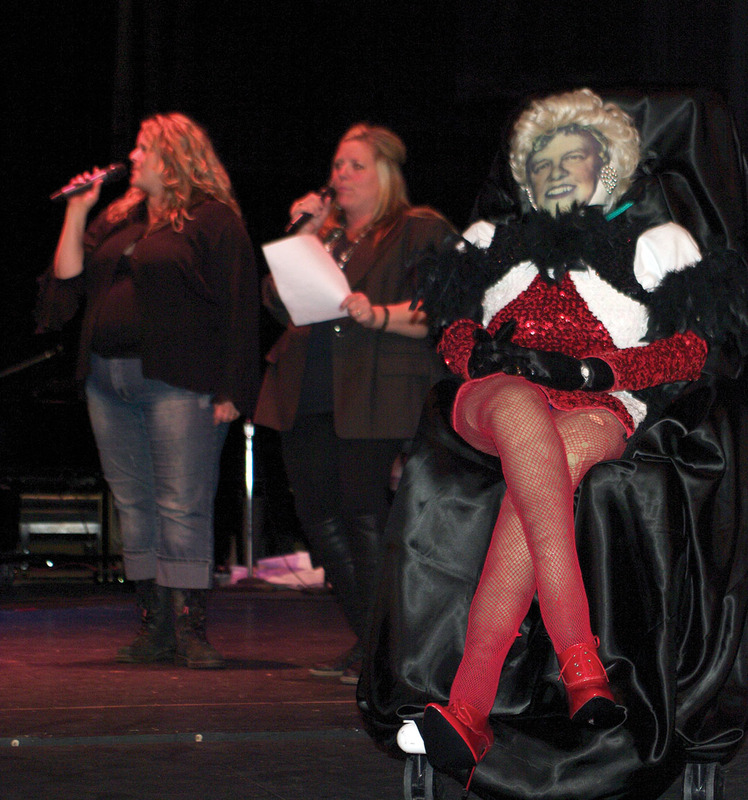 KCHS alumni Mary McCubbins-Holt and Lisa McCubbins-Thompson perform “Black Velvet” at the Pops Concert this year in the shadow of Edith D. Smith, bearing Henderson’s likeness and her signature red high-heeled shoes, which was jokingly announced as Henderson’s replacement during the Pops Concert this year. Henderson’s choirs weren’t brought to her level of par by mere sugar and spice and everything nice, after all. Henderson poured more time and energy into her choirs and students than any of them likely ever realized. In the first eight weeks of school each year, when just about every student wanted to send in an audition recording to borough honor choir, with additional recordings for those advancing to All-State, All-Northwest and All-National levels, she’d average 80 hours a week beyond the school day. “I think I have the most incredible feeder program in the world — Rosemary Bird’s choir (at Kenai Middle School) — is just amazing. With that, (students) know the level they’ll be singing at, and the parents know how well they’re singing and what they’re doing, and that puts an added expectation. And so they come in assuming they’ll be making tapes. So I end up taping everyone for the first go-around, and the second as many as want to for state, and so on,” she said. She gladly did it, year after year after year, knowing how much it meant to the students. But it wasn’t time freely given. She had expectations in return. 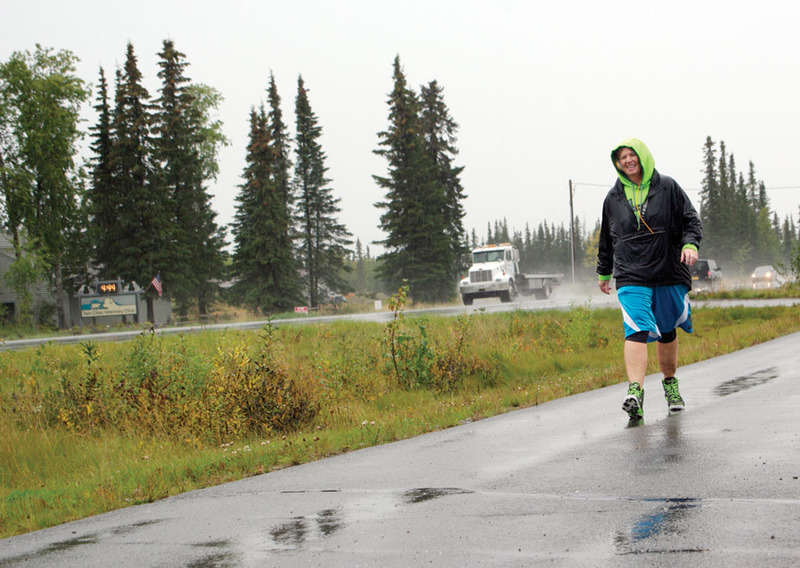 The Butler family is one many Kenai clans to have multiple generations sing with Henderson. Mom, Tana Butler, had Henderson for music at Sears Elementary School in 1973, then again for high school choir in 1983, along with her kids singing at KCHS in the 2000s. The family has a tradition of music, in which Henderson figures prominently, both in the expertise she’s bestowed and the standard of dedication and effort required to excel. And in a little humor. One never needs to wonder where they stand with Henderson, or what she thinks about things. That’s part of what got her hired in the first place, said Dale Sandahl, who as principal, lured Henderson from a teaching job in Minnesota to be music teacher at Sears Elementary in 1971. Sandahl was impressed with her degree from the well-regarded St. Olaf College, and intrigued that she was teaching 16 miles from his hometown. He called her references, two of whom he knew personally, both of which glowed about Henderson. The third was a school secretary — always to be counted on to tell it like it is. “The secretary said, ‘Well, Renee Henderson. Very good music teacher. Feisty. Testy.’ That’s all I wanted to hear. I thought those were two very complimentary words, because teaching large groups of kids, you need to have qualities like that or you’re not going to be successful,” Sandahl said. 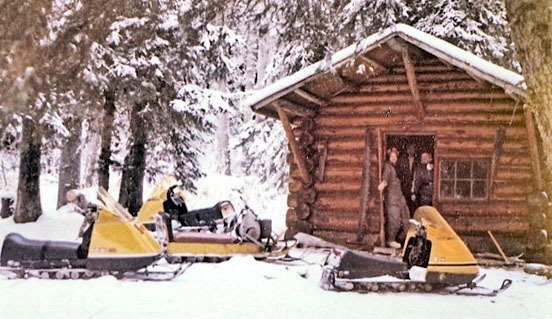 The feisty was soon tested when Henderson was additionally assigned as choir teacher at the high school a mere few months after arriving at Sears. As if shoving a lumbering piano from room to room at Sears then wrangling a burgeoning population of high schoolers wasn’t enough on her plate, two years later she began planning to take her high school choir on tour. “Most people around the peninsula thought a field trip to the other side of the inlet or around the state or something, But Renee always thought a little bit bigger. She was thinking of an international trip,” Sandahl said. “I don’t know of another word to say it, but I thought, ‘You’re nuts to even think about an international trip.’ The planning that goes into such a thing, it blows my mind. And I didn’t realize what it was like until later in my life, that not only were you dealing with where were you going to go, where were you going to sing, who were going to be the tour guides, but there was a little thing called getting this through the administration, getting it through the superintendent and getting it through the school board. Nothing like this had ever been done,” Sandahl said. Photo courtesy of Renee Henderson. KCHS senior Will Jahrig, left, hams it up for the camera with choir director Renee Henderson and junior Alan Bahr in front of St. Peter’s Basilica in Vatican City on a KCHS Choir European tour. But done it was, through Henderson’s determination and refusal to give up (see related stories, here and here), with the first choir trip in 1975 and 13 to follow. Travel had been foundational in her life and she wanted the same for her students. 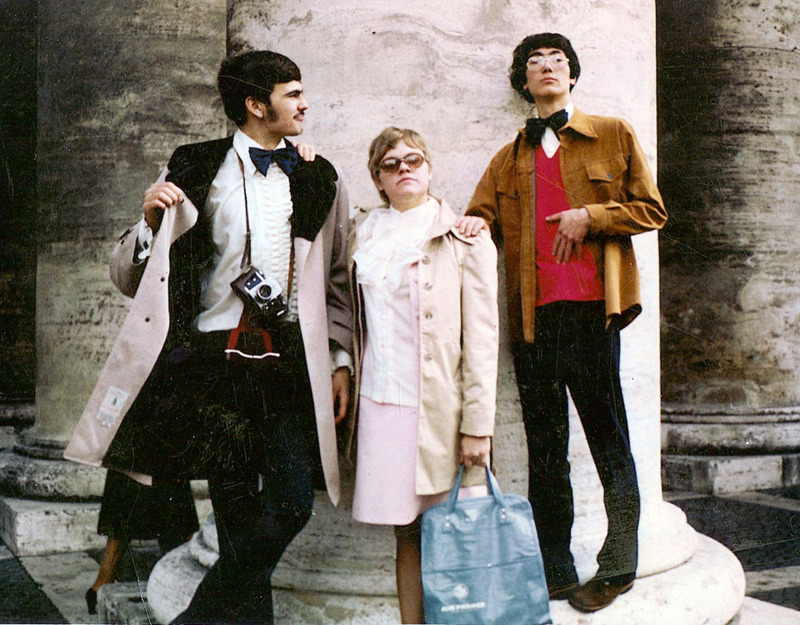 She’d hated history class in high school, but on a trip to Europe while in college she became fascinated with the world beyond her own. Longtime friend and choir accompanist Maria Allison assists Renee Henderson in rehearsing the KCHS Choir before the annual spring Pops Concert this year. The choir’s ranks swelled with alumni wanting to show their respects before Henderson retired this year. The choir tours, the Pops Concert, her uncompromising expectations and willingness to go whatever mile was necessary to help students achieve those standards are among the things that make Henderson legendary in KCHS. The other, speaking of miles, is what she chose to walk in. For most of her career, it was red, three-inch-high heels, worn just about every day to school and without fail to concerts. A foot injury in about 1990 forced her to downgrade to more sensible footwear, but her affinity for red — one that is serendipitous for her career at Kenai, since red has always been her favorite color — lives on in her wardrobe. Rare is the day she isn’t sporting a KCHS sweatshirt, or at least some article of the school’s color. That won’t change with retirement, she said. Nor will her love of teaching. “I’ll miss everything about it, except for the lack of sleep. I love the kids, I love teaching, I’m not tired of it at all, which sounds absolutely ridiculous, but I’m not,” she said. She just reached a point of exhaustion this school year, precipitated by a particularly difficult season of recordings for honor ensembles in November. The Thursday before her spring concert in April, she still hadn’t felt recovered from November. “I thought, ‘Oh, quit feeling sorry for yourself, Renee, it’s just another week.’ But I haven’t gotten my voice back from it yet. I got up that morning and thought, ‘It’s going on seven months (later). That’s a lot. It’s time to quit.’ That was the defining moment. And I’m OK with it,” she said. Her first priority in retirement is to catch up on rest. “I think the first year it’s probably going to be sleep. I’m exhausted, I truly am,” she said. Photo courtesy of Debbie Boyle. 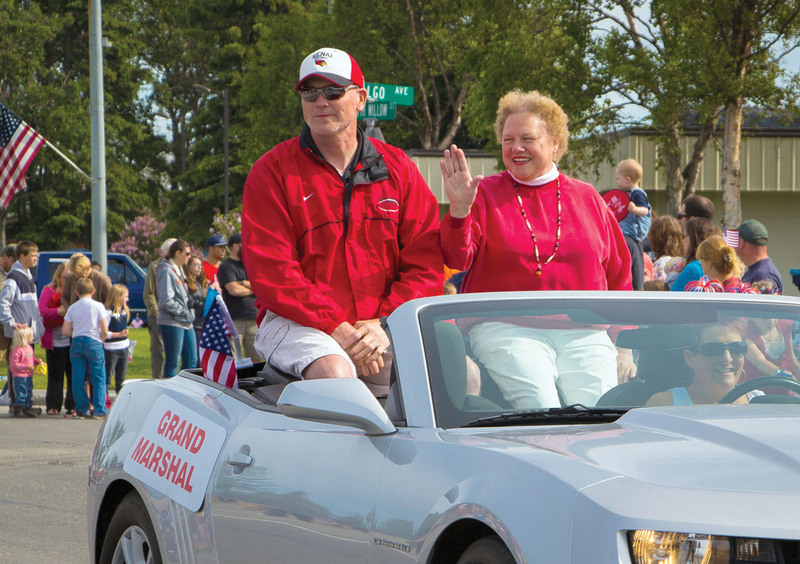 Retired KCHS Choir teacher Renee Henderson, along with former KCHS football coach and Assistant Principal Jim Beeson, was named grand marshal of the city of Kenai’s Fourth of July parade this year. She doesn’t plan to move from her beloved Kenai, which has demonstrated its reciprocal feeling for her this year, with honors and proclamations from the city of Kenai — including naming her a grand marshal in the Fourth of July parade — as well as KCHS, the school district, the governor and Alaska’s Congressional delegation. But she does intend to indulge her love of travel. She doesn’t intend to start giving private lessons, as she did the first 15 years of her career, but she would like to be a guest conductor, participating in music festivals in other school districts. Many of her former students would love for her to start a community choir. Henderson hasn’t indicated an intention to step back into her choir-directing shoes — red or not — so soon, but she does continue to fully endorse indulging the love of singing. What a great article!! I hope that picture outside the Vatican was post 1980. I was in the 1980 European tour. We were supposed to go to Rome but got diverted to Venice. (If I had to choose now, I couldn’t. I go to both) So, seeing that they finally made it to Rome gives me a big, BIG thrill!